I remember exactly where I was when I had a watershed moment that changed me as a teacher forever. In fact, it inspired my EdSurge column, Why the 21st-Century Classroom May Remind You of Starbucks. I was working on my TEDx presentation at my local Starbucks and, looking around, I realized that everyone seemed to be happy, engaged in their work, and relaxed. Some people chose the traditional chairs and tables while I opted for a big, comfy chair with my MacBook on my lap. The quiet music, perfect lighting, and overall aesthetics of the coffee shop were favorable for a variety of learners. And if I wanted to switch up my seat during my stay, I was free to do just that. That's when I decided that our classroom in 2015-2016 was going to look radically different than anything I'd ever done before. I'm a firm believer in keeping the focus on what's really important: the students. If student motivation and higher engagement is truly the desired end game, then we as teachers must adapt right along with our students in our classrooms. To see that some classrooms look the same now as they did 70 years ago is shameful. The students we share our classrooms with don't know life without constant connectivity, wi-fi, and a global audience. Outside the windows of our classroom is a dynamic, fast-paced, and ever-changing world full of choices. How can we expect our students to solve problems and make choices independently if we constantly solve their problems and make their choices for them? Our classroom environments should be conducive to open collaboration, communication, creativity, and critical thinking. This simply cannot be done when kids are sitting in rows of desks all day. Consider involving your students in a classroom redesign project with the LAUNCH cycle design thinking mentioned on A.J. Juliani's blog. Simple in-class activities can boost performance. Studies suggest that children who participate in short bouts of physical activity within the classroom have more on-task behavior, with the best improvement seen in students who are least on-task initially. 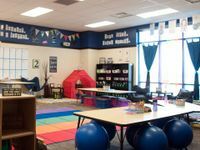 Additionally, if you're looking to convince your administrators that flexible seating is right for your students or even your entire school, my principal Jason Markusen has some interesting thoughts on this subject. Finally, Erin Klein, with her brain-based classroom redesigns, was my original inspiration. She encouraged me to "ditch the desks." Redesigning an entire classroom doesn't have to be expensive, especially with the help of Donors Choose. Sure, the Hokki stools in my classroom cost about $100 each, but other items range from free to about $30. 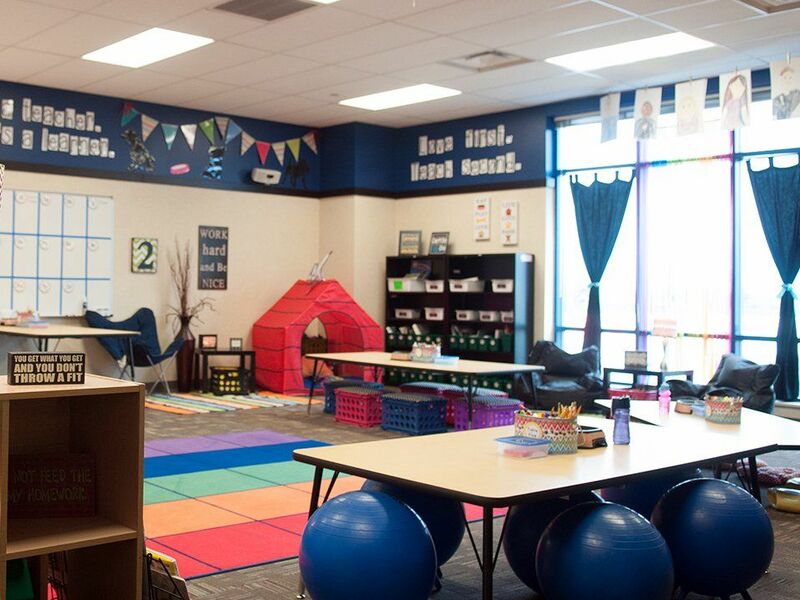 If you want to redesign your classroom on a budget, begin by purchasing some bath rugs or yoga mats, and raising a table to appropriate standing height using bed risers. Or simply take the legs off of a table and add some pillows or core discs for students to sit on. The crates pictured in my classroom cost around three dollars each. Most of the wall hangings and lamps were taken from my house, with the exception of frames from The Dollar Store. Parents are also a great resource for classroom donations. They often have money to help, but not time to give, so don’t be afraid to ask. I have a strong conviction that simply swapping out desks for tables doesn't ensure higher motivation, engagement, or accountability. Redesigning a classroom or implementing unassigned flexible seating is a shift in both structure and teaching philosophy -- an entire mindset shift. In fact, teachers need a keen intuition about where the students are working and their level of engagement at all times. We must be willing to give up the power of the seating chart and truly hand over the responsibility of seating choices to our students. I've found that the more power I give up in our classroom, the more power I get back. I've also noticed that it helps my students become more self-aware of what types of seating and environment help them learn best. And they're empowered by the opportunity to have choices. We follow the Responsive Classroom approach. The supplies that the students contribute at Open House are put into a community supply crate and used throughout the year. Each student's personal learning materials (math journals, notebooks, etc.) are housed in bins in the corner of our room. If you don't have this option, three-drawer stackers or crates of materials would be a solid substitute. Be open to removing much of the furniture in your classroom. At the beginning of the year, I got rid of four tables, my huge teacher desk, a file cabinet, and 20 traditional chairs. Our whole-group instruction still happens on the big rug in the middle of our classroom. This is where we spend much of our day. Before allowing your students to self-select seats, I strongly suggest having them try all of the seating options for an entire day. They probably won't know where they learn best until they try all the options. Students know that I reserve the right to move them at any time if they aren't fully engaged and able to work in their self-selected spot. It's a good idea to have more seating combinations than students in your classroom. I never have disagreements between students about seating because I have far more options than students. However, if I did, I would settle it the same way that I'd settle an argument over any other material in our classroom. I'm often asked, "Why should I do flexible seating this year if next year's teacher won't be doing it?" Here’s my response: Teachers can never base what happens in our classroom this year on what next year's teacher may or may not do. If it's best practice for our kids, do it now. Remember, our classrooms should be student-centered, not teacher-centered.